Piedad 2260 & Cangallo 2686, Bs.As. Aristóbulo del Valle 1257, C.P. 1295, Bs.As. Formerly: Tacaurí 127, Bs.As., also Perú 420, 3er Piso, Bs. As. Administración, Depósito y Ventas: Corrientes 3679, Bs. As. Rio Limay 1527-29, Bs. As. Fábrica: Santa Rosa 4061, Florida F.C.G.B. Ventas: Venezuela 1949 & 1949/55, Bs. As. Emilio Mitre 382 / Planes 1048-50, Bs.As. Cnel Niceto Vega 5577, Bs.As. Rondeau 3241 & Rondeau 3225, Bs.As. Florencio Varela 542, Villa Martelli, Bs.As. Florencio Varela 542, Villa Martelli, Bs. As. Rio de Janeiro 935, Bs.As. Justo Rodero e Hijos S.R.L. Av. Angel Gallardo 136/40, Bs.As. Fabrica: Rio de Janeiro 935, Bs.As. Justo Rodero e Hijos S.A.I.C. Now: Casino Justo Rodero e Hijos S.A.I.C. Avda Belgrano 124, 3er piso, Bs.As. Fabrica de Naipes VIGOR S.R.L. Lavalle 2001, V. Maipú, San Martin. Av. Diaz Velez 986 - Villa Sarmiento, Bs.As. 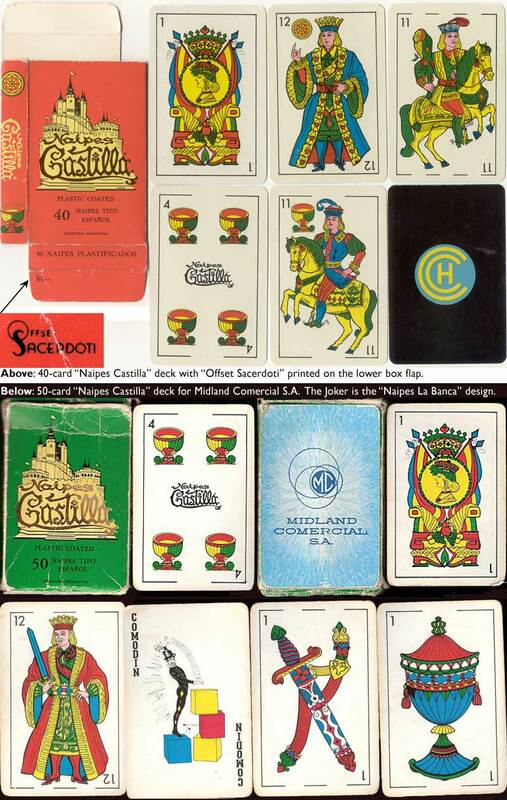 Since the end of the monopoly of the Real Fábrica de Naipes de Macharaviaya (Spain) in 1815, there have been a number of importing agents, as well as manufacturers from other countries, who have imported playing cards into Latin America. 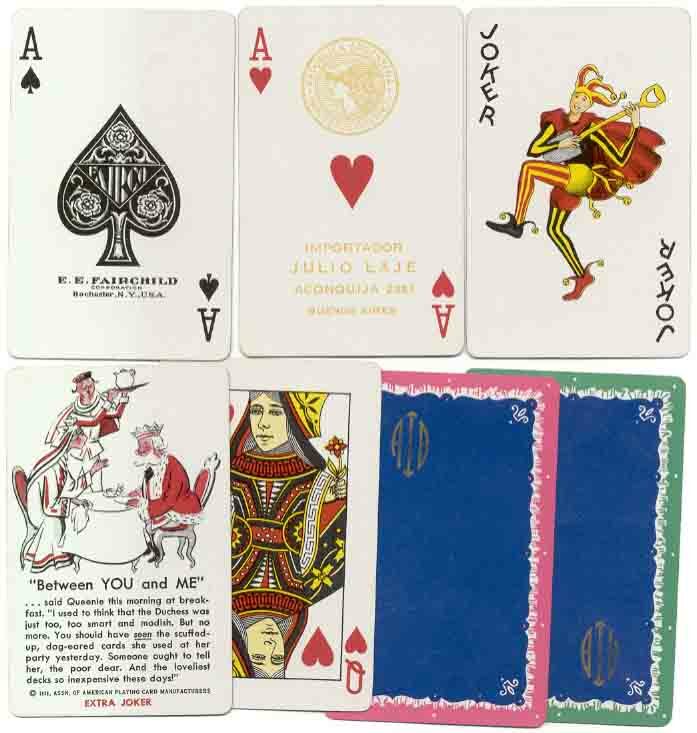 Cardmakers in the U.S.A. for instance (particularly Dougherty and the U.S.P.C.Co) have tended to care for their minority populations, particularly the Latin-American ones. 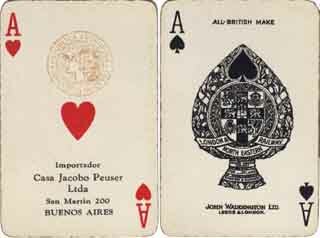 Belgian cardmakers have exported cards to South America since the mid-19th century; these had a distinctive style of their own. 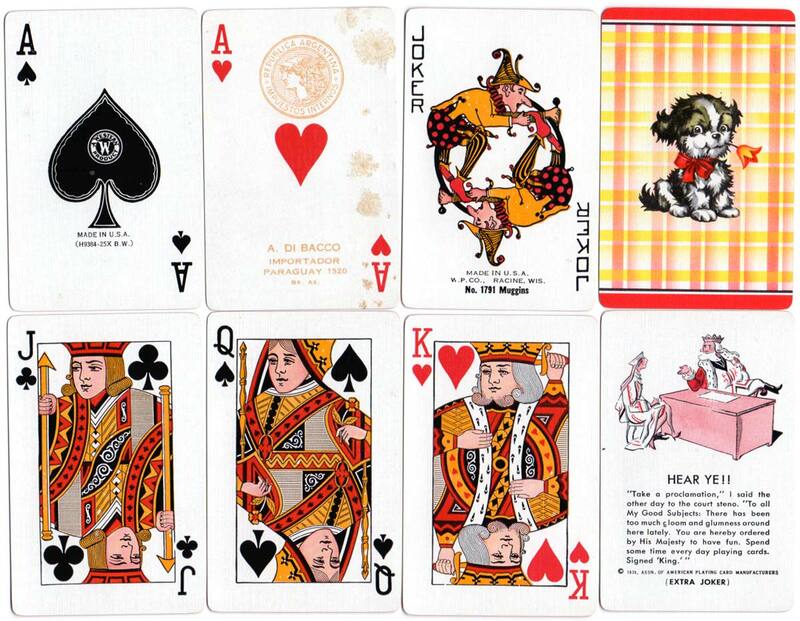 Above: No.35 Squeezers imported into Argentina by Bertrand Domec, whose details are overprinted on the Ace of Hearts, c.1927. Bertrand Domec had a long-standing relationship with the NYCCC and was their exclusive agent in the River Plate region. 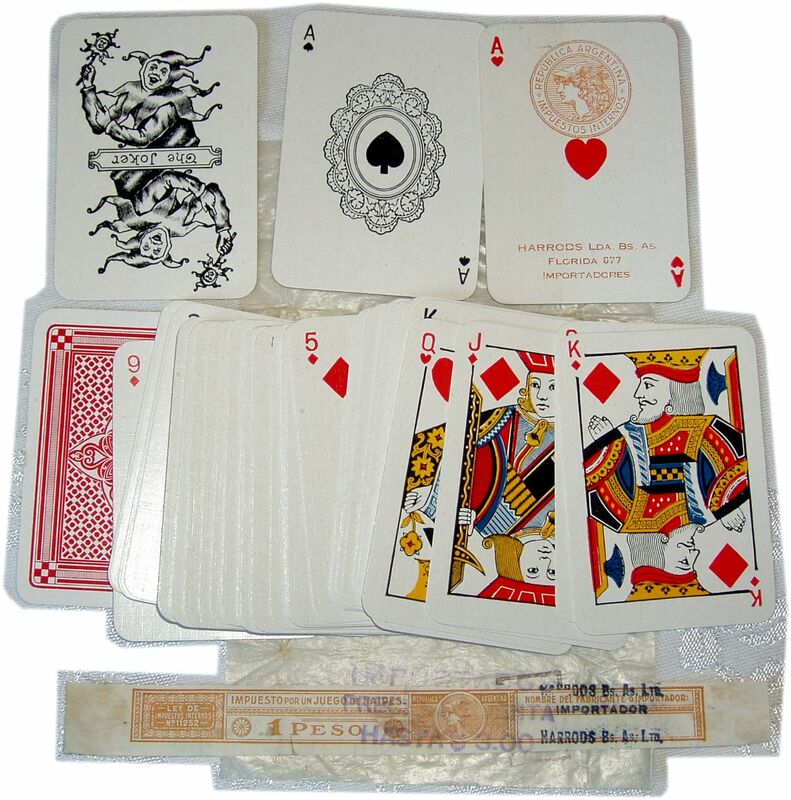 Italian, German and French card makers are also known to have manufactured Spanish type packs. Versions of the Spanish Catalan pattern are found today in Argentina, Chile, Brazil, Paraguay, Honduras, Uruguay, Venezuela and Peru, whilst the 19th century Cádiz style is found today in Peru, El Salvador and Mexico. The "Castilian" pattern is found in Mexico, Chile, Argentina and El Salvador. Uruguay and Colombia also use the distinctive "Parisian Spanish" pattern. Tacaurí 127 - taken over by Joker S.A. (see above)? Above: The agent Bertrand Domec, whose fortunes can be followed through the changes of company name and address, was the exclusive agent of The New York Consolidated Card Company, U.S.A. Brands such as "Squeezers", "Bee-92" and "Congress" were used in Argentina. 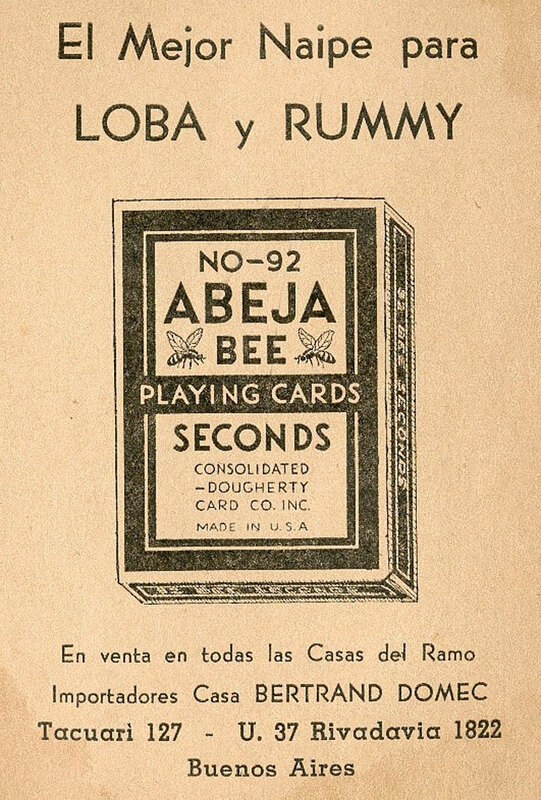 Records from the Cádiz chamber of commerce confirm that 15,420 packs of cards were exported from Cádiz to Argentina in 1908; 5,860 packs in 1910 and 2,720 packs in 1937. Greater quantities than this were exported to Mexico, the Canary Isles, Cuba, Chile and the Philippines [source: Pérez González, 1995]. E.E. Fairchild Corp., Rochester, N.Y. The N.Y. Consolidated Card Co.